Category: What Should I Eat? Ok, so I have finally written another “what should I eat?” blog. I know this one is overdue. If you have read the others, you know how much I love love love good food. Bone broth for breakfast!, Eggs, noodles, veggies, and yes bone broth. This post is about one of my most favorite things… bone broth. And this is the time of year for it. So, as you are going through your list of spring detoxes consider adding some bone broth to the menu of your self-care. One of the biggest differences between Oriental medicine and Conventional “diet therapy” is a strong belief that your food should be cooked. Slow cooked foods are seen as more nourishing versus raw food, juices, smoothies, and nutrients in pills. Bone broth is at the top of the charts. 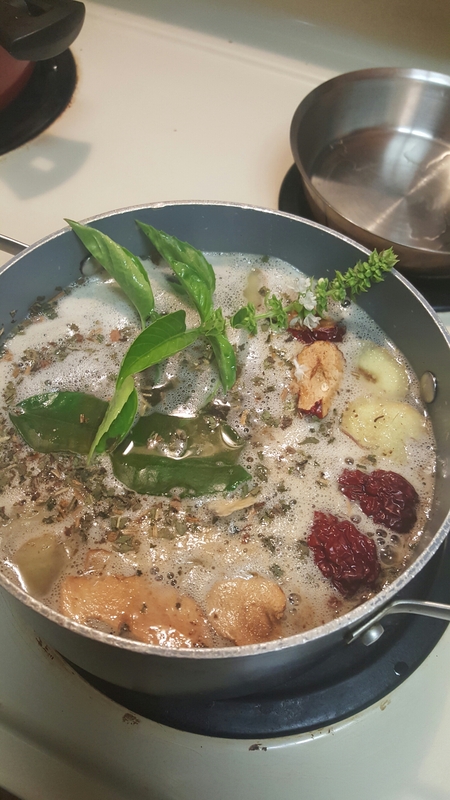 Bone broth is not a perfect food and is not suitable for some; I will go into greater detail in part 2. 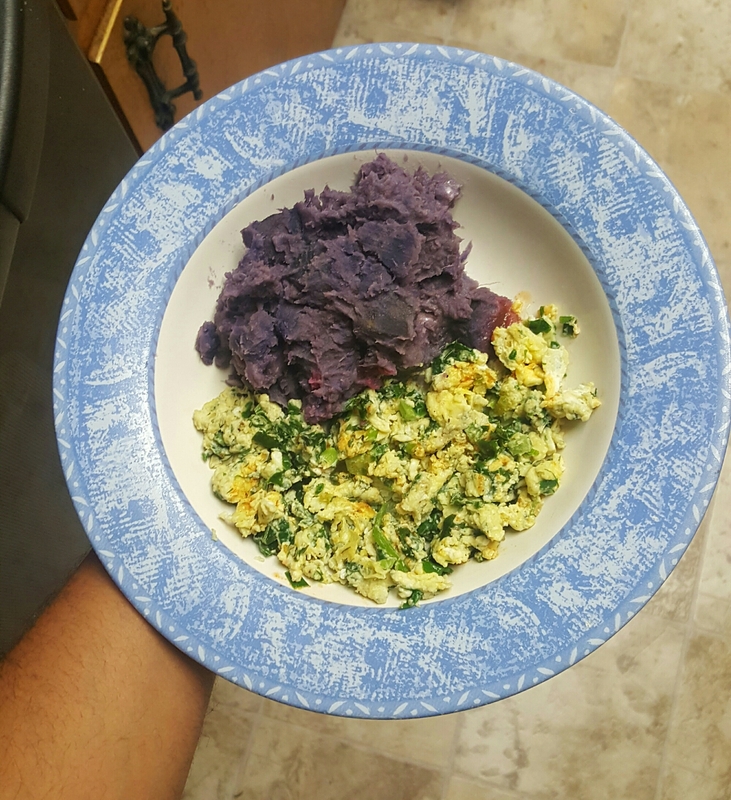 Purple yams with coconut cream, eggs with; kale, chives, and fresh dill. If you don’t know by now, I’m a foodie. I love, love, LOVE to eat good food. I’m also a firm believer in letting your food be your medicine and your medicine be your food. People spend a lot of time on random things, but food isn’t on the list anymore. As a single mom, a business owner, and a homeschooling parent time is in short supply around my house: I still cook my son breakfast every single day. Huang Qi, Da Zao, Shu Di Huang that I add to my chili. What Should I Eat? Real Food! This is kinda the first in a series of blogs I’ve enjoyed writing called “What should I Eat?” I find it disturbing how many people can’t answer that question. In these pages, you will find some of my kitchen magic. So check back periodically to see what’s in the “What should I eat?” files. Now to answer the question: What should I eat? Food. Real food. Lots of it. There’s an old saying let your food be your medicine and your medicine be your food. This is what a typical full market run looks like in my house. No that’s not all of it. There is eggs, almond milk, meat, and other odds and ends that are already in the fridge. (I ran out of counter space. 😆) If you look carefully you don’t see a bunch of packages. What I can fit on the counter after grocery shopping. I’m often asked “what should I eat?” Usually people are asking about how to lose weight or how to “detox.” No one ever asks me how to use food as medicine. So since it’s cold and flu season i thought I’d share ways to use your kitchen as a pharmacy.